I remember there being quite a lot of hype for these ice-cold Coke vending machines when the first one popped up under Island Beverly (near Sogo) in Causeway Bay. Alas, Hong Kong’s combination of heat and humidity meant the machine apparently didn’t work too well during one of our trademark sticky sweaty summers. It quietly disappeared a few months later. But that wasn’t the last of these icy Coke vending machines. We spotted one, classily located next to a dingy back alley, on our epic trek round Wan Chai on my quest for Gosh cosmetics. 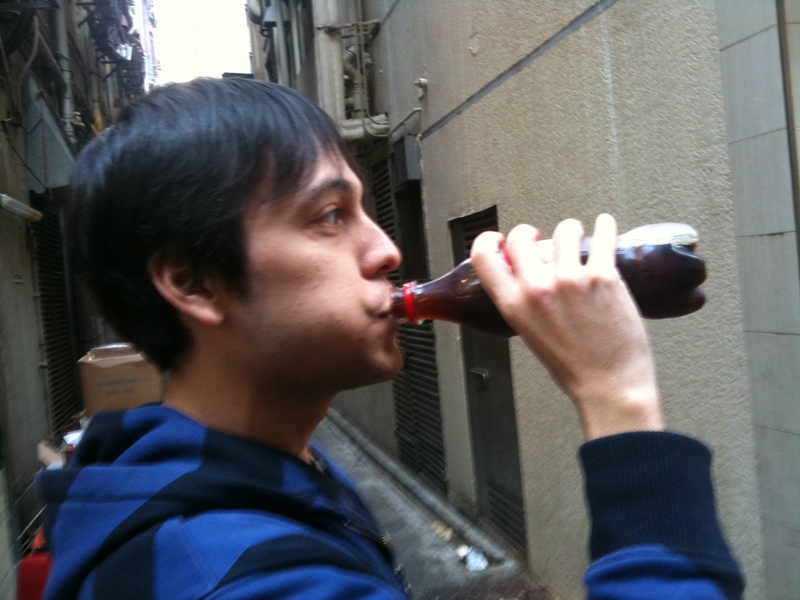 My boyfriend (a Coca-Cola connoisseur… or simple addict… who has fizzing black gold constantly coursing through his veins) decided to give it a go, at $11 a bottle (Octopus card only). I was on hand to commemorate the experience photographically. Alas, the Coke didn’t arrive via a polar bear wearing shades. The first step was to open the bottle and take a quick sip – I presume this was to prevent the bottle exploding due to contraction/expansion caused by freezing (science geeks, feel free to clear up my ignorance in the comments). This step was boring so no photos here. 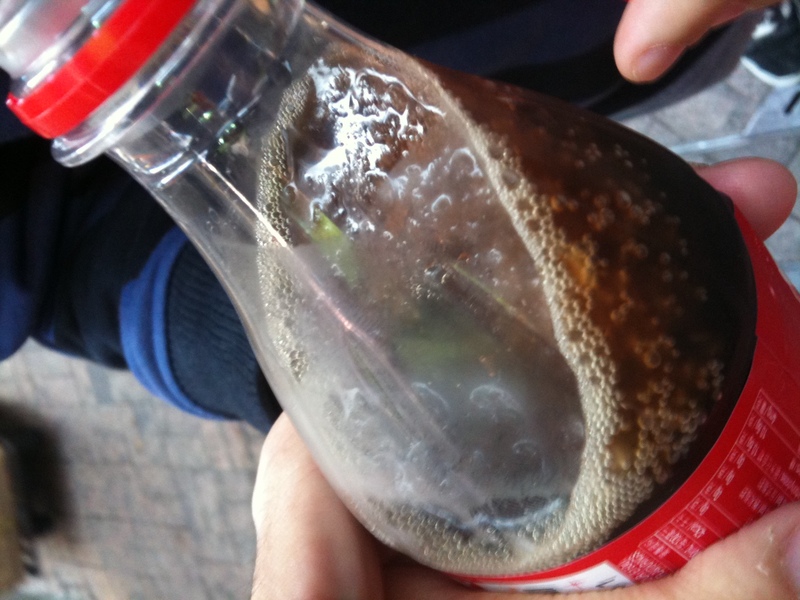 Second, slowly turn the bottle upside-down, whereupon ice crystals start to form in your Coke. To compensate for no pictures of the last step, I took two pictures of this one. Yay! Ice magic! You can really see it in the close-up below. 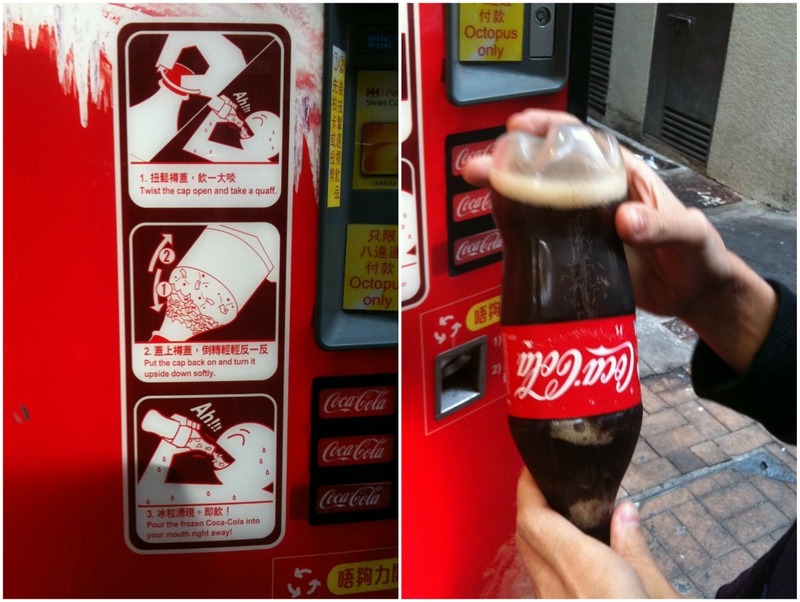 Finally, tip back your head and quaff that frozen Coke right away! Dingy back alley optional. It was a cool day so everything worked perfectly and the Coke stayed icy for ages. It tastes like a Coke slushie, only you don’t have to put up with a surly-faced cinema employee to get it. It would probably taste even better on a hot summer’s day – providing the technology still works, that is! I’m sure there’s a scientific explanation for this, but I prefer to think the Coke fairies did it. 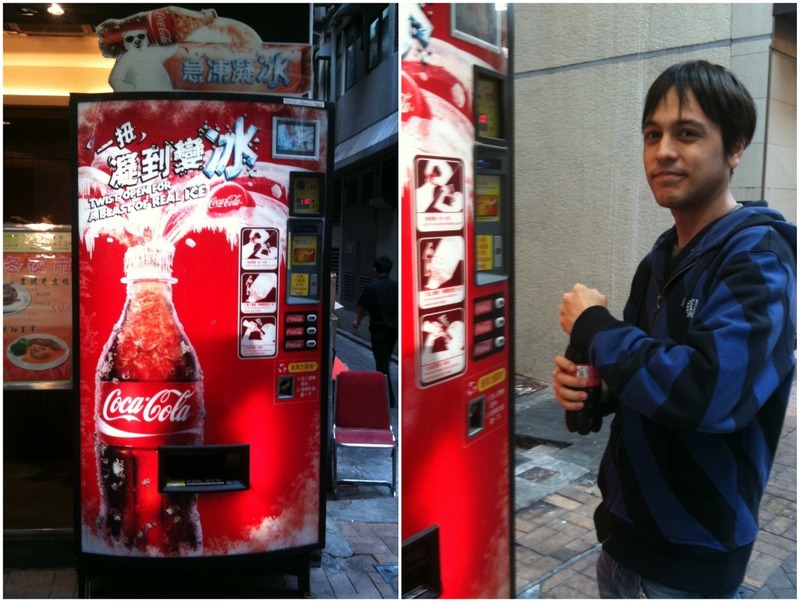 This entry was posted in Hong Kong, Random and tagged Asia, Coca Cola Ice Up vending machine, Coca Cola icy vending machine, Coca Cola slushie machine, Coca Cola vending machine, Coca-Cola, Coke, cool stuff Asia, cool stuff Hong Kong, frozen Coke vending machine, funny things Asia, HK, Hong Kong, quirky stuff, self-freeze Coca Cola vending machine. Bookmark the permalink. Hey Justin – Thanks for replying and helping Helen out! Unfortunately, I’m rubbish at navigating so can’t really remember where in Wan Chai this is! My boyfriend thinks it’s near the M&S Food store, and I think it might have been opposite the big Delifrance… sorry I can’t be more exact, they do tend to pop up and move around all over the place, I’ll try and reply again when I’ve spotted another definite location! Helen – Just saw one today in the LCX section of Harbour City mall in Tsim Sha Tsui! Hope that helps!